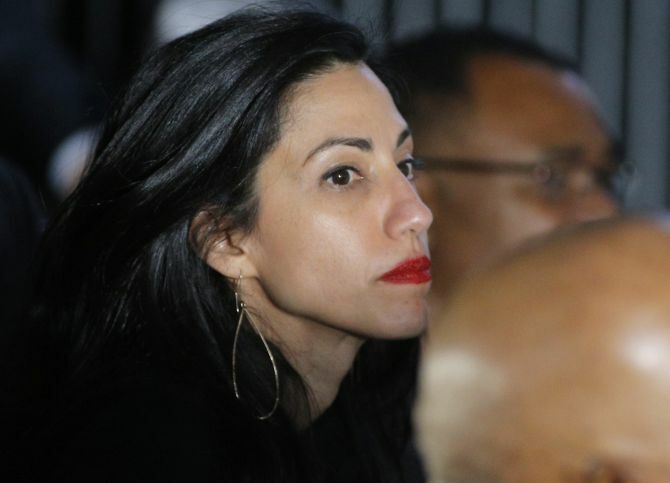 Rediff.com » News » Will Huma cost Hillary the White House? If November 9 ushers in a Hillary Clinton presidency, you can bet your last dollar that Huma Abedin will be back at POTUS' side. Huma Abedin, whose parents were born in India, has been working tirelessly with Hillary Clinton since 1996 when she first arrived in the White House as an intern in the then First Lady's office. If Clinton makes it to the White House next week, Huma -- despite last week's e-mail thunderstorm -- will be at hand to help her mentor navigate her way through the daily grind of being POTUS, the single most powerful person on our planet (sorry Xi, sorry Vladmir, you don't make that cut). Elegant, sharp, hard-working, but very private, that is Huma Abedin. Huma -- who stands 5' 7" in her stockings, but is usually seen in tasteful 3 to 4 inch highs; she loves heels unlike her boss who prefers dull kitten heels or flats -- turned 40 on July 28. Her father was born in Delhi in 1928, and studied at Aligarh Muslim University. Her mother was born in undivided India, but which is now in Pakistan. 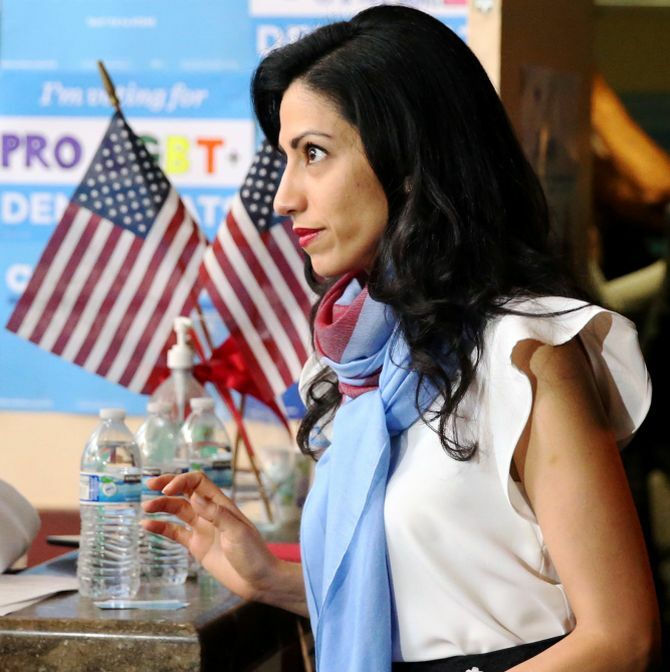 Huma was born in Kalamazoo, Michigan, the American state with the largest Muslim population. Her parents came to the US to earn doctoral degrees at the University of Pennsylvania. Her dad Dr Syed Zainul Abedin had an affiliation of some sort with the Muslim Students Association at Western Michigan University, which is how Huma came to be born in The Wolverine State. Huma spent her childhood and early adolescence -- 16 years -- in Jeddah, Saudi Arabia, where her parents moved when she was 2. She hails from a conservative Muslim family. Her mom Dr Saleha Mahmood Abedin (who teaches sociology at the Dar Al-Hekma College, a Jeddah university and is the editor-in-chief of The Journal of Muslim Minority Affairs) wears a burkha, as would be expected of someone who lives and works in Saudi Arabia. Huma (her name means lucky) made it to this year's The Muslim 500, a list of the most influential Muslims globally, issued annually by the Royal Islamic Strategic Studies Centre, Amman, Jordan. Last year, Huma tweeted: 'You can be a proud American, a proud Muslim, and proudly serve this great country. Pride versus prejudice.' She speaks English, Hindi, Urdu and Arabic. She also tweets about iftars, Eid and more. But there are no pictures of Huma visiting a mosque or praying. And she married a Jew. She attended a British girls' school, the name of which is not listed. 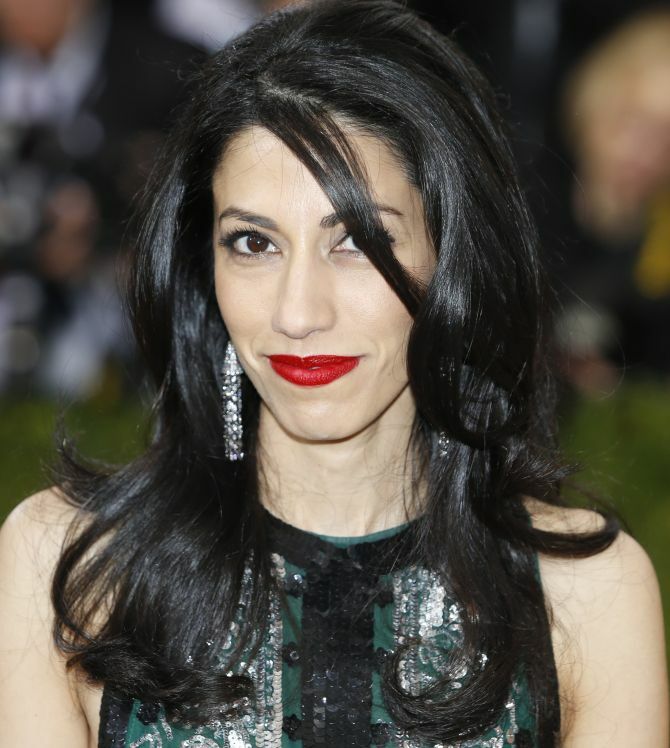 Huma returned to the United States in 1994 to attend George Washington University. She studied journalism at GWU and was also the associate editor for 12 years of the Journal of Muslim Minority Affairs, which was published by her family. Huma has certainly brought elegance to her job -- always smartly attired, the epitome of power dressing -- often sporting Oscar de la Renta, Vera Wang and Alexander McQueen. In stark comparison to the dowdily dressed Hillary. In a podcast to Call Your Girlfriend, Huma revealed that Hillary and she love to talk about shoes, celeb gossip, but most of all about food! Her intellect, deep knowledge of current issues, discretion, competence and smarts made certain that her internship with then then First Lady, that started when she was about 21, expanded into the role of an aide and over two decades her portfolio of responsibilities has grown leaps and bounds. For the 2016 campaign, of which she is the vice-chair, she helped pick the key players on the Clinton staff. The Clintons have never publicly expressed an opinion about Huma's controversial husband, but it is widely speculated that they despise him. Huma first met Weiner at a 2001 Martha's Vineyard Democratic National Committee retreat, where he expressed interest in her and she mildly snubbed him. They married nine years later. Like Hillary, Huma stood by her philandering husband who has been entangled in multiple sexting scandals. Unlike Hillary, she dumped him after the most recent sexting scandal hit the headlines, especially when one photograph Weiner sent a young lady had their son Jordan in it. Before the Hillary Clinton 2016 campaign began in earnest, the high-powered Huma was a work-from-home mom, raising Jordan Zain Weiner, who will be 5 in December, and caring for two cats and a straying husband. Perhaps in an attempt to resurrect Weiner's DOA political career (his plan to be New York's mayor capsized, you guessed it, when a sexting scandal hit the fan), the famously private Huma agreed to participate in a documentary, Weiner, on her husband's failed mayoral race, stunning everyone who thought they knew her. Thanks to the sexting scandal of a few months ago, the Federal Bureau of Investigation announced it would investigate if Weiner had committed a crime by appearing in a photograph with a minor (his son Jordan). The FBI took Weiner's laptop into custody and discovered on it countless e-mails Huma had exchanged with Hillary when both ladies worked for the State Department. After announcing in July that the FBI's investigation into Hillary's use of a private e-mail server when she was secretary of state had not endangered confidental matters of State information, Bureau Director James Comey -- once a registered Republican (and incidentally once the US Attorney for the Southern District of New York, a position Preet Bharara occupies currently) -- announced 11 days before the US presidential election that Hillary and Huma's mails were the subject of an investigation. 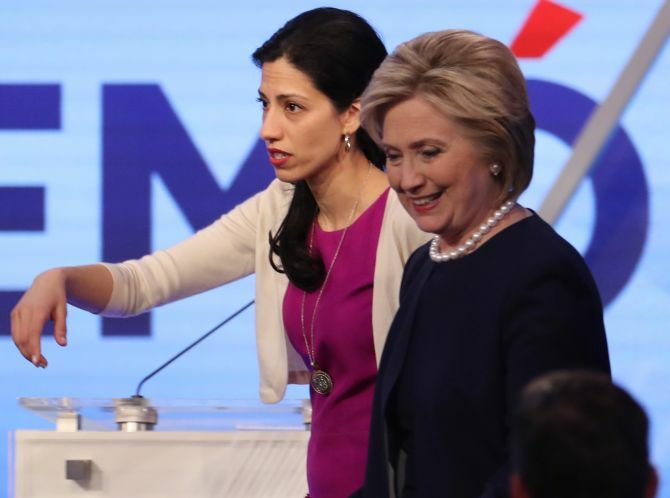 The FBI threat could unravel Hillary's chances of becoming America's first woman president (not to speak of the shudderable prospect of Donald Trump in the Oval Office) and if that were to come to pass, Huma Abedin would be the one responsible. By her carelessness. Unless using her husband's laptop and not her own was to elude legal scrutiny. Huma is no stranger to controversy. She has been accused of links with the Muslim Brotherhood, to the possibility of her being a Saudi spy, even of being an agent for Al Qaeda! Needless to say, these bizarre charges have come from the same sort of Americans who root for Trump and his hateful, xenophobic, politics. 'The ad, which began running this week, is being played on Zee TV, TV Asia, Star TV, Times Now, Gemini, AAJ and around 10 other stations,' the Post added. 'Huma in general is as pro-terrorist as you could be... she's got a really dark background. I can't even fathom. 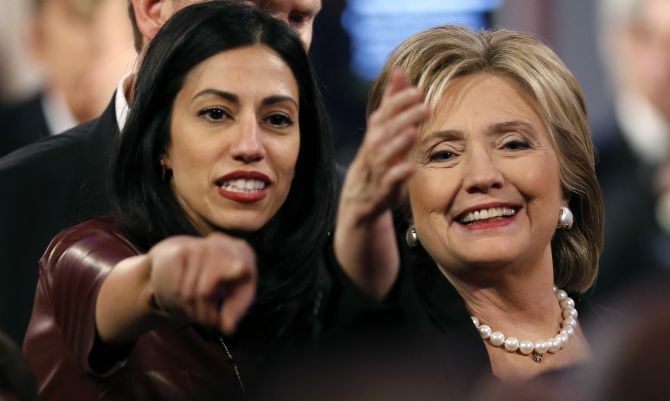 I don't understand why Hillary will associate herself with Huma",' Chicago businessman Shailabh Kumar, who paid for the October 15 rally for Donald Trump told the Post. 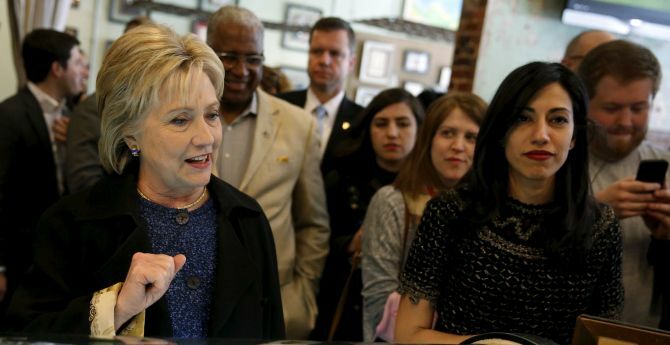 Abedin: Have you been going over calls with her (Clinton) for tomorrow? So she knows (Manmohan) singh ls at 8?
. (Another aide, Monica) Hanley: She was in bed for a nap by the time I heard that she had an 8 am. call. Will go over with her. Abedin: Very imp(ortant) to do that. She's often confused. Neither Hillary nor Bill have said a word against Huma since the FBI announced its probe. Their rage and the anger of the Clinton campaign has been directed against James Comey for behaving like his long-dead predecessor, the much feared J Edgar Hoover, trying to influence the direction of American politics. If November 9 ushers in a Hillary Clinton presidency, you can bet your last dollar that Huma Abedin will be back at POTUS' side, after a few discreet months away from the limelight. India's elected a Trump, will US now get a Modi?